The loss proved extremely costly in fact as Anand was pushed to eighth spot in world rankings and was staring at his worst world ranking for almost two decades now. World champion Viswanthan Anand's poor run continued as he suffered his second straight loss, succumbing to American Hikaru Nakamura in the sixth round of the Tal memorial Chess Tournament now in progress in Moscow. After losing to world number one and world crown challenger Magnus Carlsen of Norway in the previous round, Anand's loss against Nakamura only added to the woes of the Indian. Making matters worse is the tournament situation that now has the world champion sharing the eighth spot in the 10-player tournament on just two points with only three rounds to come. Nakamura leads the 100000 Euros prize money tournament on 4.5 points out of six games and this is commendable given the fact that the American started off with a loss against Shakhriayar Mamedyarov of Azerbaijan in the event. Boris Gelfand of Israel stands sole second on four points and he is followed by Mmaedyarov and Carlsen on 3.5 points each. Another half point behind is Fabiano Caruana of Italy and Dmitry Andreikin of Russia while Sergey Karjakin is now sole seventh on 2.5 points. Anand, Alexander Morozevich of Russia and his compatriot Vladimir Kramnik share the last spot on two points from six games thus far. 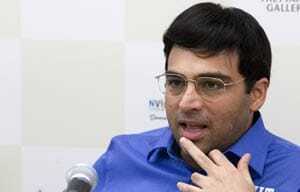 The day provided little excitement apart from Anand's game as the remaining four ended in draws. Boris Gelfand gave little chance to Magnus Carlsen to complicate matters out of a Queen's gambit declined and settled for a draw after reaching a minor piece endgame while Fabiano Caruana could not prove an advantage against white against a recuperating Vladimir Kramnik. Dmitry Andreikin again gave little away and drew with Mamedyarov while Alexander Morozevich split the point with Karjakin. Anand's loss with white pieces may have dented the confidence of the world champion but all the remains is to do some damage control in the tournament that is not going his way. Playing the white side of a Ruy Lopez, Anand was surprised early as Nakamura went for some unorthodox set up resulting in complications and the Indian ace could not strike his best form to find an advantage. Nakamura found his way to an advantageous endgame by going for right exchanges and in the end it was a knight and pawns endgame wherein the American had the final say thanks to a remote passed pawn. Anand lost in 45 moves and has lots to recover in the last three rounds post the second and final rest day in the tournament. Results round 6: V Anand (Ind, 2) lost to Hikaru Nakamura (Usa, 4.5); Boris Gelfnad (Isr, 4) drew with Magnus Carlsen (Nor, 3.5); Dmitry Andreikin (Rus, 3) drew with Shakhriyar Mamedyarov (Aze, 3.5); Alexander Morozevich (Rus, 2) drew with Sergey Karjakin (Rus, 2.5); Fabiano Caruana (Ita, 3) drew with Vladimir Kramnik (Rus, 2).